Business films have two intrinsically negative traits; they’re full of dislikeable characters and they aren’t very good at explaining themselves. Cinematic financial icons Gordon Gekko and Jordan Belfort were avaricious and nefarious bandits pilfering cash under the guise of shoulder padded legality. These aren’t moral creatures capable of passing as endearing protagonists. Similarly, we understand they lie, cheat and steal in order to stuff their pockets, but this vague notion of moneymaking is surrounded in smoke and mirrors. Recent financial crash drama Margin Call explains the meltdown through an indecipherable blend of jargon and stern whispers – we understand something gravely awful has occurred with little idea of what exactly that is. Even the great Citizen Kane hides the technicalities of business behind the magnetic Orson Welles. 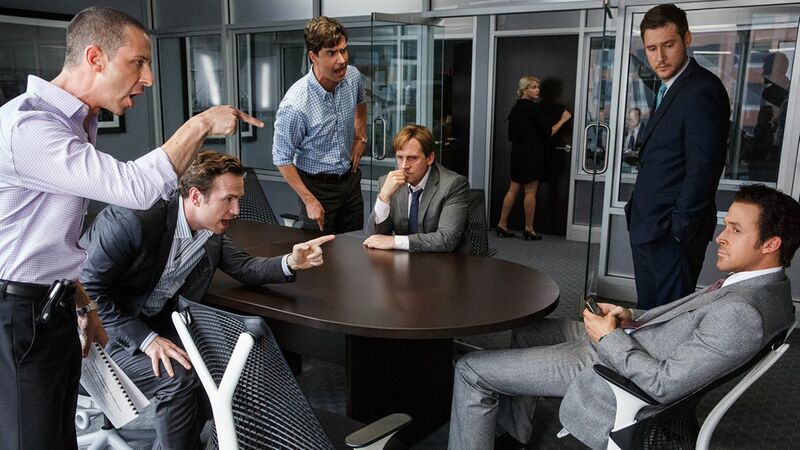 What makes The Big Short remarkable is that despite being so heavily rooted in finance and business, it manages to both explain itself impeccably and inject humanity into its capitalist tale. Based on Michael Lewis’ 2010 book of the same name, the film follows an enterprising band of “freaks and outsiders” who first spotted the impending US housing crisis, and subsequent global financial collapse, and were brave enough to take on the banking powerhouses. The caveat is that their motivation for taking on the likes of JP Morgan, Bank of America, and Goldman Sachs wasn’t driven by a moral duty to prevent impending disaster, but to profit from the bank’s hubris. Director Adam McKay, famous for his comedy collaborations with Will Ferrell, appears the most unlikely of candidates to reinvent the financial drama, but that’s exactly what he’s done. The 2007 crash, an insurmountable mystery to many including myself, is explained via a selection of accessible, fourth wall defying vignettes. These include Margot Robbie, lathering in the bath obviously, explaining subprime mortgages and chef Anthony Bourdain breezing through how bad CDOs are packaged into viable investments. It’s impossible for these absurd interludes not to appear a little patronising, but the gimmick successfully, and crucially, explains the founding concepts of the crash, and subsequently the whole film. It’s this tongue in cheek, wholly self-aware, approach that epitomises the film’s accessible nature. At times, the ensemble cast of chancers strongly resembles crime caper Ocean’s Eleven. 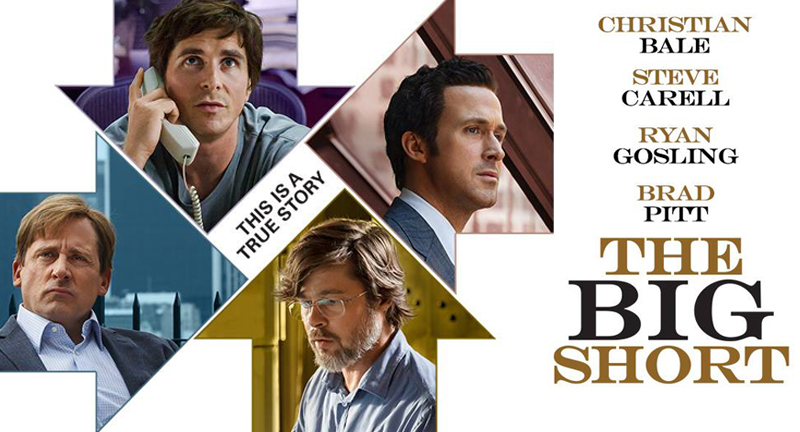 The Big Short operates as the polar opposite to the deadly serious Margin Call which explores the 2007 crisis with an estranging level of gravity and complexity. McKay makes a concerted effort not to bore the viewer by using comic asides, fast pacing and a revolving perspective to keep us entertained. It’s not quite funny enough to be a full on black comedy, but there’s enough humour in the script to elevate the heavy material. The inevitable market collapse is presented through the simple metaphor of Jenga by amped up Deutsche Bank salesman Jared Vennett (Ryan Gosling) to a sceptical Mark Baum (Steve Carell) and his hedge fund colleagues. It’s these two opposing forces that epitomise the narrative moral dilemma. Vennett, who narrates the film, is the closest character to the classic Wall Street bigshot. Gosling moves away from his usual aloof coolness as Vennett in order to play the inadvertent comic fool. His outbursts about smelling money in the air and whooping round the gym resemble Cuba Gooding Jr’s eccentricities in Jerry Maguire. If Vennett is the unscrupulous salesman you wouldn’t buy a car off, according to Baum, then Carrell’s character is the one who’d scupper the deal with his impulsive cries of honesty. Baum is angry at life. Since his brother’s suicide his world view has become irrevocably skewed. He’s constantly hit with pangs of guilt for living off Wall Street and has become contemptuous that everyone’s “walking around like they’re in a damn Enya video”. When Vennett approaches Baum about making big bucks betting on the crash he’s deeply troubled by the fact he’s profiting from a disaster that will ruin millions. Carrell, after his sinister excellence in Foxcatcher, is superb in the key performance. His Tourette like blurts of truth are humorously endearing but also profound in the context of the wide spread deception around him. He’s the exception to the rule; you can indeed like someone who’s making bucket loads of cash. Broker-come-apocalypse enthusiast Ben Rickert (Brad Pitt) is a similarly grounded protagonist who’s tasked with mentoring two young traders with dollar signs in their eyes, Jamie Shipley (Finn Wittrock) and Charlie Geller (John Magaro). The trio’s dynamic successfully plays off the youthful exuberance of making it big against the larger, moral, implications at hand. The real oddball of the cast is Michael Burry (Christian Bale), the man who first spotted the precarious foundations of the housing market. He’s a presented as the socially awkward maths genius, marginally less autistic than Hoffman’s Rain Man. Bale’s been nominated for an Oscar, but Burry is a detached, impenetrable, figure. His contextualising as an outsider is tritely unconvincing, the flashback to childhood traumas particularly clichéd, and he never feels especially integral to the tale after the first twenty minutes. 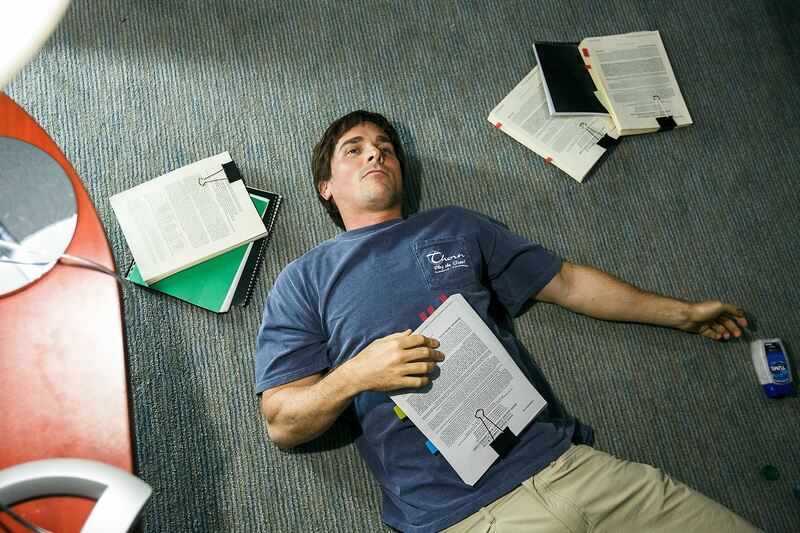 For all its quirks and comedy, The Big Short has a bleak bottom line. Mark Baum, despite his gains, surveys the financial wasteland and bleakly notes “we live in an era of fraud in America. Not just in banking, but in government, education, religion, food. Even baseball…” McKay does a noble job of bringing the institutional corruption to the fore, rather than revelling in the excess its riches, but there’s no resolution, no change and no comeuppance for the bankers. Ben Rickert rues the speculation and states the hard facts of the crash; “people lose homes. People lose jobs. People lose retirement savings, people lose pensions…every 1% unemployment goes up, 40,000 people die, did you know that?” Maybe it’s time we took stock and finally saw beyond the poisonous Wall Street mantra “greed is good”.